Another successful Tennessee Advanced Energy Business Council Annual Meeting is in the books thanks to Schneider Electric. In Franklin, TAEBC members, stakeholders and supporters gathered at Schneider Electric’s newest Nashville Hub and while there witnessed renowned Tennessee collaborator and partnerships builder Tom Ballard receive the Thomas B. Ballard Advanced Energy Leadership Award named in his honor. The Thomas B. Ballard Advanced Energy Leadership Award honors exemplary leadership and success in championing, connecting, and strengthening Tennessee’s advanced energy economy. The Tennessee Advanced Energy Business Council champions the state’s advanced energy economy as an economic development and job creation strategy through sharing information, connecting stakeholders, and strengthening the industry. These pillars are personally exemplified by the tireless work of Tom Ballard, an unparalleled leader, educator, mentor, and advocate of Tennessee’s advanced energy economy. TAEBC also announced the Thomas B. Ballard Advanced Energy Leadership Award will be an annual award, accepting nominations every year and presenting the winner with the honor at future annual meetings. Ballard stepped down as long time board member for TAEBC, and Ameresco’s own Steve Seifried was appointed by the board to fill Ballard’s vacancy. Wingate explained the approach Schneider Electric took is very different from a purchase power agreement. “We gave them a price per kilowatt hour less than what they were paying,” said Wingate. 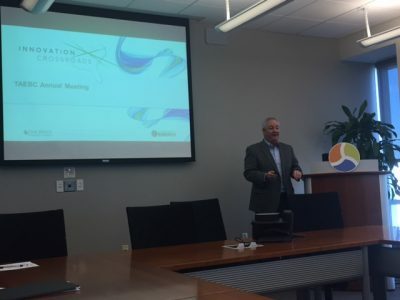 Attendees also heard from Chris Hansen, TVA’s Director of Pricing Strategy & Origination, who spotlighted the energy company’s efforts to meet renewable energy expectations of Google and Facebook for new data centers the companies were constructing in the Valley. Both global giants are known for their commitments to sustainability and clean energy. 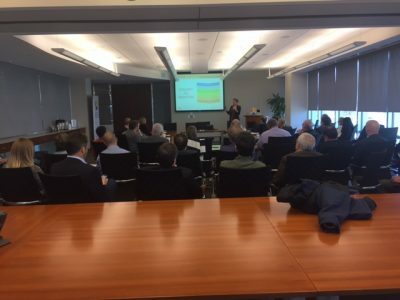 At the end of the event, Schneider Electric hosted a technology showcase highlighting the company’s microgrid solutions, energy automation & control systems, and smart home technologies. Credit: Teknovation.biz for parts of this blog post. The Tennessee Advanced Energy Business Council hosted its Annual Meeting Wednesday in Nashville. During the meeting, it was announced Mary Beth Hudson, Vice President Wacker Polysilicon NCA and Charleston, Tenn. Site Manager as well as Ryan Stanton, Program Leader Smart Cities and Urban Infrastructure at Schneider Electric would serve as TAEBC’s new board members. Ryan fills Jim Plourde’s board term, as Jim has accepted a new position as Director of Energy Solutions at Powersmiths, a Canadian company that provides products and services that deliver energy and cost savings opportunities to customers. TAEBC thanks Jim for his service and extends our congratulations on this new position. He’ll continue to be engaged with TAEBC championing advanced energy as an economic development and job creation strategy. Thank you, Jim for your leadership during TAEBC’s formative years. TAEBC would also like to thank Jimmy Glotfelty of Clean Line Energy Partners and Tom Rogers and Beth Conerty of Oak Ridge National Laboratory and Innovation Crossroads for speaking during the annual meeting. Members enjoyed hearing more about 2017’s energy outlook and opportunities. The Tennessee Advanced Energy Business Council thanks member Bradley for hosting the annual meeting and providing a venue. TAEBC’s continued success and growth is credited to its members as we look ahead to 2017. TAEBC is positioning the state and its members to increase our leadership role in the $1.3 trillion global advanced energy market. In order to do this, TAEBC is focused on four goals in the New Year. Inform the national energy agenda. Help Tennessee become the #1 location in the Southeast for high quality jobs. Foster the growth of Tennessee advanced energy technologies and startups. Support TVA’s efforts to become the utility of the future. TAEBC member, Schneider Electric recently announced that the company will consolidate its existing Middle Tennessee operations in Davidson and Rutherford Counties to Williamson County, opening a major Southeast regional office in Franklin. The consolidation will relocate approximately 900 current employees and create 250 new jobs. Schneider Electric’s regional office will be located at Two Franklin Park in a newly constructed 150,000 square foot space, which is slated to be complete by the fourth quarter of 2017. The workforce will be comprised of engineering, sales, R&D and corporate functions for several national and global business units. Schneider Electric is the global specialist in energy management and automation. With revenues of ~$30 billion in FY2015, 160,000+ employees serve customers in over 100 countries, helping them to manage their energy and process in ways that are safe, reliable, efficient and sustainable. From the simplest of switches to complex operational systems, our technology, software and services improve the way our customers manage and automate their operations. Schneider’s connected technologies reshape industries, transform cities and enrich lives. Learn more at www.schneider-electric.com. To read the official announcement, visit here.